I am spending the Summer of 2017 upgrading our local city park. I donate my labor, and either a local non-profit or the City pays for the materials cost. I wanted a showcase item for the park, and decided to make it a 22 foot diameter Victorian style gazebo. It took me 3 attempts to finally get the design right in Google Sketchup. This is a “walk-through” design with the concrete floor the same height as the sidewalks in the park. It took me 4 weeks to build and erect the gazebo, and it has 497 different pieces of wood in it. It is almost all 2×6 pressure-treated wood construction, with a little bit of 2×4’s in it. Both roofs are 20 degrees. There were many, many compound angle cuts involved with this project. Everybody in our small town loves the finished gazebo, and there is already talk of holding weddings in the gazebo. You can see the whole design and build process on my woodworking web site here. Once again Dale you did a great job. Your town is lucky to have you. You might consider running for Mayor after you get all those projects done! Nice design and implementation. As JCamp said, your town is lucky to have you. Totally agree with both comments ==GREAT WORK on a very community oriented item! I would skip the “mayor” gig though! No rewards; all headaches! i agree with the above every small town wishes they had somebody like you.ive looked at some of your others projects and this isnt the first time youve improved your community,your a beautiful person dale,i wish the world had more like you.congrats. This gazebo is a very impressive pieced of work. With regards to running for Mayor, being a small town mayor is a really thankless job. I would rather work on projects to improve the town, versus all the thankless tasks a mayor has to do. Fortunately, we have had good mayors in our small town over the years. Very nice work, Dale. As the others said, your town is lucky to have you. What a wonderful donation to your city. Every time you see someone enjoying its shade or admiring its design it has to bring a giant smile to your face. I know it would for me. It just so happens I was married in one of these. 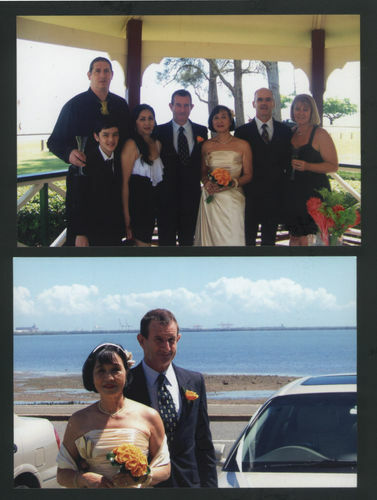 Thats us some years ago and my still beautiful Bride today.